"Results May Vary" - The "Murphy in the Morning" team gears up for their live all-day coverage of the mid-term elections, again competing with Avery, who is reporting alongside John Haggerty (Peter Gallagher), the Wolf Network's conservative superstar. Also, Pat is horrified when Miles forces him to wear a conservative suit after assigning him to analyze numbers and trends on-air throughout the day, on MURPHY BROWN, Thursday, Nov. 1 (9:30-10:00 PM, ET/PT) on the CBS Television Network. 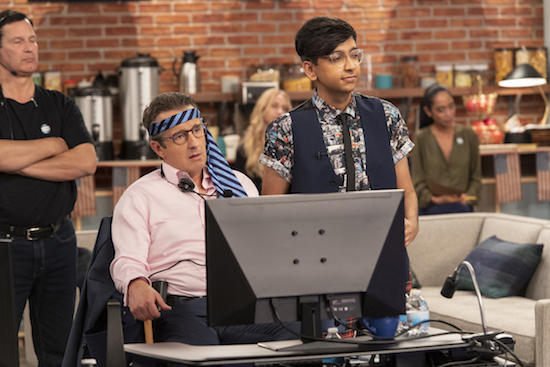 Pictured L-R: Grant Shaud as Miles Silverberg and Nik Dodani as Pat Patel Photo Credit: David Giesbrecht / 2018 Warner Bros. Entertainment Inc. All Rights Reserved.